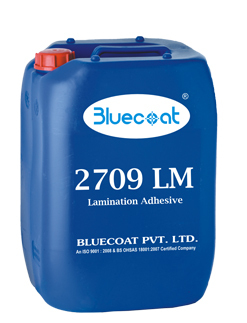 Bluecoat 2709 is a polyvinyl Acetate dispersion used for print lamination. Bluecoat 2709 is suitable for print lamination of BOPP, Polyster, PVC and other films giving excellent flatness, adhesion, transparency and gloss with paper. 6-8 months if properly stored. Bluecoat 2709 is available in wide open mouth 50 kgs carbuoys which allows complete removal of material.